Soon you'll be able to subscribe to Amazon Prime and download any book to your device. Print is dead. People have been saying that for years but Jeff Bezos' Amazon might be the company that actually brings about the Book-mageddon. 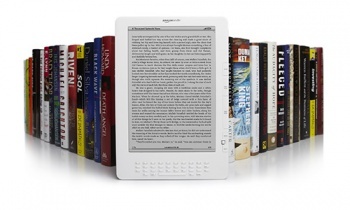 After the public resisting the concept of electronic books for a generation - even though we had the technology - Amazon's Kindle device has slowly saturated the market of the world's book readers. With the Kindle, you still have to buy a "copy" of electronic books - which can sometimes cost more than a paperback of the same title - but now in the works is a subscription model. Amazon will charge $79 for an annual membership to its Prime service, which will include unlimited downloads of any book in its library. As reported by the Wall Street Journal today, Amazon is negotiating with book publishers for such deals right now. Publishers of these books are not really happy about the idea. "Publishers are going to be very reticent to assign a value of zero to their products," said Peter Kafka on the WSJ's Digits show. "They don't want to convey the idea that their products are worth nothing." That's why the first deals that would be ironed out will likely be for older books in publishers' portfolios, instead of bestsellers that are currently only in hardcover like George R. R. Martin's Dance with Dragons or still profitable for a certain audience like the Hunger Games or Twilight series. Stephen King's latest masterpiece might not be free in this service, but Richard Bachman's might. I probably wouldn't pay $79 a year for such a service, but that's not all that Amazon Prime entails. You also get free two-day shipping, and streaming of some movies and TV shows similar to Netflix. Consider that Netflix charges $7.99/month for streaming video - which totals $96 a year - and suddenly getting books, TV and movies for $79 doesn't seem terrible. I would miss my bookshelf, though. The Kindle is a great device, but it's no substitute for the look and feel of a well made book.